I'm late to the party on these. Zoeva have been around a while and I have deliberately completely ignored them. Do you know why? Well firstly because when everyone else raves about something I go in the other direction (not always a great idea), and secondly because I assumed they were in some way related to Zoella. I don't have anything against her but I just don't think her products would be my jam. I was wrong. I got to have a fondle of some Zoeva brushes in a friends kit and they are really nice. So nice that I immediately ordered some when I got home and will probably order more when I need them. They are a company deeply committed to charity - especially helping women who have suffered domestic violence. They are a cruelty-free brand though they do use goat hair which is combed or shaved at no harm to the animal - for some this may be a bit of a grey area. My favourites are the 110 Face Shape which is beautifully rounded and actually the perfect shape and size for doing wax and cream bases if you are not covering the whole face - and if you are covering the whole face and find normal foundation brushes too big. This is synthetic hair and a lovely compact shape mean you can use it for powder and creams. It washes really well and retains it's shape. will be getting a few more of these. I should mention that in the pic mine have pink tape round them so I can easily tell which is mine on set. The majority of lip brushes in my kit are ones that have lids and when working on set recently I found I needed more conventional lip brushes. The 331 Square Lip Brush is a square tipped synthetic brush which is great for quick, sharp application. As you can see the end of mine has stained but apart from that (I blame the lipstick not the brush) it cleans well. I really like the short handles on these brushes and it's rare for me to find a brush that I don't have anything similar to in my kit and the 110 Face Shape is just that. They are incredibly good prices for the price and from what I've seen I really like the ethics of the company. 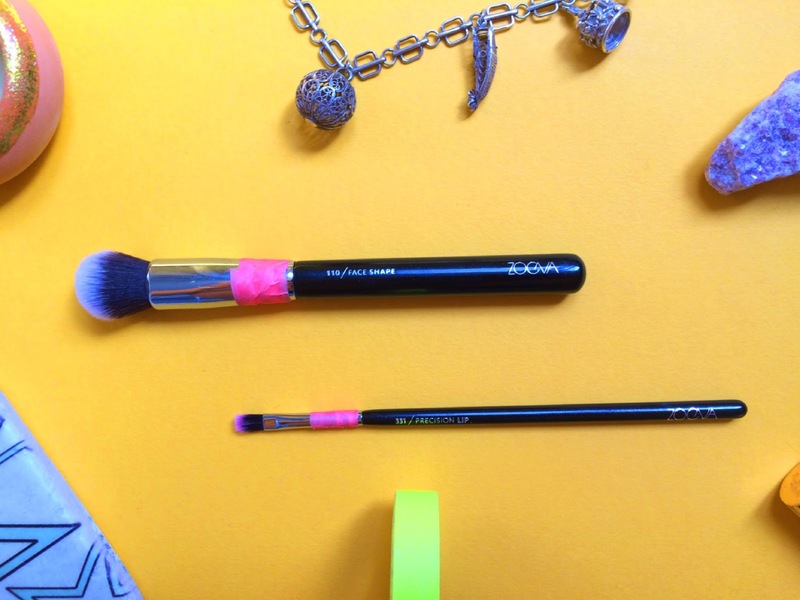 For those wanting to find some new brushes - Zoeva is one of my top recommendations of the moment.